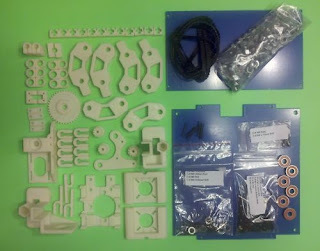 This entry is posted a little out of my actual build sequence – but just because I was really pleased with how well the Wade’s Extruder http://reprap.org/wiki/Wade%27s_Geared_Extruder build went this weekend. The first question you may be asking: “Why Wade’s Extruder?” There are so many extruder designs going (check out http://reprap.org/wiki/Extruder ), why this one in particular? The answer is quite simple – because the RP'ed parts came with my Metric Prusa Kit. I figured I might as well go with the one I already had the parts for, and I can always choose a different design, or modify this one later. Before commencing the build, I downloaded and printed Gary Hodgson’s visual guide: http://garyhodgson.com/reprap/wades-geared-extruder-visual-instructions/ and watched the assembly videos on the Wade’s Extruder page http://reprap.org/wiki/Wade%27s_Geared_Extruder . However, I was still a little apprehensive – I had never heard of a “Hobbed Bolt” before, let alone made my own. My kit http://julianh72.blogspot.com/2011/08/my-parts-list.html came with all the parts I needed (apart from the Stepper Motor, which I had purchased separately http://julianh72.blogspot.com/2011/08/my-parts-list-stepper-motors.html ). First task according to the visual instructions was to “Hobb” the bolt, which acts as the friction drive for the filament extruder. The Wikipedia entry on “Hobbing” http://en.wikipedia.org/wiki/Hobbing did not fill me with any more confidence: “Hobbing is a machining process for making gears, splines, and sprockets on a hobbing machine, which is a special type of milling machine. The teeth or splines are progressively cut into the workpiece by a series of cuts made by a cutting tool called a hob.” What the …?! I don’t have a “special type of milling machine”; all I have is a vice and a drill – how is this ever going to work?! I did a trial assembly of the extruder, main gear, bearings and bolt, to mark the location where the friction grooving would be required to drive the filament through. Following the video instructions here: http://reprap.org/wiki/Wade%27s_Geared_Extruder#How_to_build_it , I clamped a narrow “rat-tail” file in my vice, and fitted the bolt in my drill (protecting the threads with some insulation tape), and a couple of minutes later had a nice rounded groove in the shank of the bolt. I then fitted two bearings onto the bolt, and clamped them into the vice (protecting the bearings with some insulation tape) to allow the bolt turn easily while I cut a thread in the groove with an M3 thread tapper. Two more minutes work, and I had what looked like a nice “Hobbed Bolt” (to my untrained eyes, anyway). I then assembled the whole extruder body assembly. Note for the uninitiated: the visual instructions say at Step 4: “(Optional) You may wish to insert the x-carriage bolt now, as this may be difficult once the idler is in place.” Trust me – this is NOT optional – there is simply no way the X-Axis Carriage bolts are going to go in later – do it NOW! (My set-up has two bolts to mount on the X-Carriage, one of which is mounted under the Motor, and the other goes under the Idler Block. The bolt under the Motor MUST be installed before the motor; the bolt under the Idler Block can be installed later, but you might as well get it over and done with now. I initially assembled the Idler Block using 4 M4 washers on each bolt, as suggested in the Visual Instructions. The springs supplied with my kit were too long to press down to fit over the bolts with the washers installed, or indeed, without any washers. This was easily fixed by cutting two springs in half and installing half-length springs over each of the bolts, but they would only fit if I removed all of the washers. I am actually not sure what the washers are for – the guide says "If you add 3 or 4 M4 washers on each bolt before you put the idler block on, it will reduce the idler block travel when loading new filament, making loading new filament much easier", but the whole thing went together better for me by leaving the washers out, and the springs should allow enough “give” in the Idler Block to allow for loading of new filament – I guess I will find out when I start commissioning! I then found that when mounting the motor, I had to leave the washers off the motor-mounting bolts that fit under the gear head to get the gear to clear them, and I had to add another M8 washer under the main gear to get it far enough off the face of the extruder body to clear everything. This in turn meant that I had to cut a new Hobbed groove in the bolt (the extra washer meant that my first groove was now not aligned with the filament feed point) – but I was getting good at “Hobbing” bolts by now, so this was no real problem! I don’t have any 3 mm PLA or ABS filament as yet, but I do have some 2 mm "whipper-snipper" line, and I was really please to discover that when fully assembled, it grips onto the 2 mm filament REALLY strongly, and the whole mechanism is very smooth, and pulls the filament through very nicely. Hopefully, it will be just as smooth under electric power, working with 3 mm filament! I actually find this quiet extraordinary – that it is possible to design and fabricate a complex high-precision assembly like this, that a complete novice like me can build. Think about this: the extruder motor has 200 steps per revolution, and with 1/16 micro-stepping, this makes 3,200 controllable micro-steps per revolution. The pinion gear has 11 teeth, and the big gear has 39, and is driving an 8 mm diameter pinch shaft. Each revolution of the motor therefore gives 11/39 of a revolution of the pinch shaft, which is equivalent to feeding 11/39 * pi * 8 = 7.1 mm of filament; each 1/16 controllable micro-step feeds the equivalent of about 2.2 microns of filament – just amazing! The next stage of the build was the assembly and installation of the X-Axis. This went more or less without a hitch. The only significant problem I encountered was that after assembling the X-Axis and installing the X-Axis motor, I found horizontal cracks in both the X-End Idler Mount and the X-End Motor Mount. In both cases, a crack had opened up between two horizontal layers of the RP’ed parts at about mid-height. In the case of the Idler Mount, the crack opened up right where the Idler Shaft bolts to the Mount. I don’t know if the crack was there when the part arrived, or if it was just a line of weakness that I opened up by over-tensioning the nuts on the Idler Shaft. In the case of the Motor Mount, the crack appeared in the vertical “slot” where the Z-Axis PLA bushings are glued; again, I don’t know if this was a pre-existing crack, or one that I created by being a bit ham-fisted in my whole approach to the assembly. Another small issue was that the instructions indicated that the “spare” overhang length of the X-Axis Smooth Rods should be kept at the X-Axis Motor end. I found that the rearmost rod just slightly interfered with the installation of my stepper motor (a slightly smaller motor body would probably be able to fit fine), so I had to reposition the rods with all of the overhang moved to the Idler end – this was easily accomplished by loosening the securing screws, sliding the rods along, and re-tightening the screws. Having assembled and aligned the main frame to the best of my modest abilities, it was time to commence the assembly of the Y-Axis, comprising the two rails which run from front to back carrying the print-bed, the print-bed carriage itself, and the Y-Axis belt-drive system. I was a little bit nervous about the overall alignment of the frame (see my previous posting http://julianh72.blogspot.com/2011/08/main-frame-build-and-alignment.html ), and in particular the fact that the Y-Motor mount was a bit warped (a consequence of the practical limitations of precision of home-baked RP parts, I guess) – hopefully this would all resolve itself in the following steps. Again following Gary Hodgson's excellent “Visual Instructions” http://garyhodgson.com/reprap/prusa-mendel-visual-instructions I first installed the two round-bar rails, and then aligned them against the long sides of the acrylic print bed bottom plate which was supplied with my kit. I then snapped 2 PLA bushings onto each rail. At first, they were quite tight, but they all freed up nicely with a light smear of electric shaver oil and running them along the rails 20 or 30 times. What I DIDN’T do was to measure the dimensions of the supplied acrylic print-bed bottom plate before I glued it on. In hindsight, I should have! The print-bed bottom plate is slightly wider than the clear space between the main frame bottom corner vertices, which means that the print-bed cannot travel quite to the ends of the rails, limiting my Y-Axis movement to about 170 mm, rather than the 200 mm that the Prusa is supposed to be capable of. The clear space between the corner vertices is 234 mm; the print-bed bottom plate is supposed to be 140 mm x 225 mm (which would fit between the corner vertices with about 4 mm to spare on each side), but the supplied plate is 140 mm x 240 mm, so it clashes with the bottom corner vertices. I have decided to proceed with the build accepting the slightly limited Y-Axis travel for now – hopefully this won’t cause me any grief later on, but for anyone who has the same kit as me: you may want to check the dimensions BEFORE you install the Y-Axis print-bed bottom plate, and consider modifying it (and the top plate as well!) first. Installing the motor and belt all went without a hitch – apart from the fact that the Y-Motor Bracket is slightly distorted, so the motor shaft is slightly skew to the toothed belt. This would probably be a big deal if it was a geared drive, but the motor and print-bed both seem to move smoothly, so hopefully this will be fine. I will only know for sure when I get power to the motors later in the build. The only other slight issue I have is that the bottom run of the toothed belt is making slight contact with the threaded rod which will anchor the bottom ends of the Z-Axis rods. It is only the slightest contact on the smooth side of the belt, and it doesn’t seem to be catching, but I will probably tape over the threaded rod to avoid premature wear and tear on the belt. Anyway – another milestone achieved – and now on to the assembly of the X-Axis. I have been contacted by another Brisbane-based RepRapper who also purchased the same kit at about the same time as me (his was delivered a bit later than mine), and he also had no troubles getting the M8 nuts to fit on his M8 threaded rods. He confirmed that the packaging for the nuts was the same as mine, and he has measured his threads and confirms they are standard M8 1.25 mm pitch. (I don't have the tools to confirm the thread pitch of my M8 nuts, but I have measured my threaded rods and confirm they have 1.25 mm pitch.) When we catch up with each other, I'll make sure I have samples of my threaded rod and nuts, and we'll see if we can figure out what the difference between his kit and my kit are. So for now, the root cause of my problem remains unresolved (although I have a work-around of buying replacement nuts) - as Alice would say: "Mysteriouser and mysteriouser ..."
Having sourced all the parts necessary for the main frame, it was time to start the actual assembly. I downloaded and printed a colour copy of Gary Hodgson's excellent “Visual Instructions” http://garyhodgson.com/reprap/prusa-mendel-visual-instructions from the Mendel Prusa Assembly Wiki page http://reprap.org/wiki/Prusa_Mendel_Assembly . While having on-screen pictures and videos is all very well, I find there is nothing quite like a good hard copy alongside you when you are attempting any sort of complex project! The two triangular end frames went together very easily (now that I had sourced some nuts that actually fitted my threaded rods!) I was very careful with my measuring, and when I was finished, the two frames were identical equilateral triangles, which could be overlaid on top of each other very nicely in any orientation. I was very pleased with the results - so far, so good! Next came the front, rear and top threaded rods. Again, following the instructions carefully, on my first evening’s work I had completed the basic assembly of the main frame – not bad! … or so I thought! On closer inspection, the frame was sitting with only three feet on the ground – the fourth foot (the rear left corner) was sitting about 5 – 8 mm above the ground. No big deal, I thought – I simply slackened off all the front, rear and top nuts to loosen the joints, stacked up some decent weight on the frame to hold it flat on the ground, and very carefully, I gradually snugged up all of the nuts to an even tightness. When everything was tight, I confidently removed the weight – but the back left foot sprung up off the floor again! I went through this process several times, but no matter what sequence I used, every time I finished, the frame was very slightly out of alignment again. I am not sure exactly what is going on, but I suspect that the rod holes in the RP’ed corner vertices are not perfectly square onto the face of the vertices, so when everything is tightened, one or more of the front, rear and / or top rods are not quite at a perfect right-angle to the end frames. The only way I could resolve the issue of the uneven feet was to also slightly adjust my perfectly-formed end frames. I was very reluctant to do this, because the end frames seemed to be so perfectly aligned, but I could see no other way around it! Eventually, I got the whole frame rigid and sitting firmly on the ground – but if you look very carefully, you can see that the cross rods are not all perfectly parallel to each other. Whether this matters or not, or whether it is best to “smear” the alignment imperfections across the whole frame (as I have effectively done) or to keep “perfect” end frames and live with imperfect alignment of the feet, I am not quite sure. I guess the proof of the pudding will come when I am ready to fire up the machine and see what happens. More updates to follow, as my build progresses. … and then I stopped! Aaaaghhh! The supplied M8 nuts don’t fit my M8 threaded rods! They look like they should be the right size, but they just won’t go onto the threaded rods. 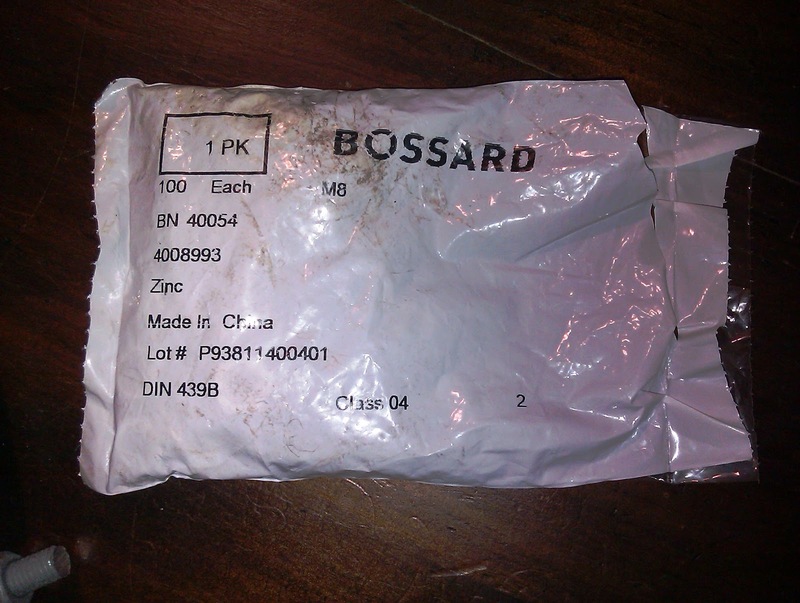 The packet they came in identifies them as “Bossard BN 40054”. 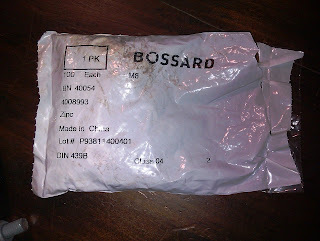 I tried to find the nuts on the manufacturer’s website but the product code doesn't seem to exist; the nearest I could find were BN 40079 https://eu.shop.bossard.com/ch/index.cfm?app_page=0:31001:30002:11670:1 which should be the correct thread (1.25 mm metric pitch). I got my build going again by buying a bag of standard M8 nuts from my local hardware store, and I have contacted my kit supplier to alert him to the issue - I suspect the company which supplied the nuts to him has either mis-bagged them, or they could be cheap counterfeit Chinese items. Moral of the story – if you are buying a metric kit from a USA-based supplier, get them to check the metric parts carefully – they may not know how to check the dimensions of the various metric components. My Parts List: Rods of Steel! I picked up the M8 threaded rods from the local Mitre 10 hardware store for about $25, which I had to cut down to the required short lengths, while for the 8 mm round bar, I just went for plain steel round bar from a local steel merchant for about $12. Again, I had to hacksaw the raw stock (6 metre length!) into the required short lengths, and file the saw-cut ends smooth. Hopefully, plain steel bar will be OK; if necessary to reduce friction, I will swap the plain steel rod for more expensive stainless / chrome steel rod - time will tell, I guess. They arrived about a week after I ordered them - very nice units! Oh well - as they say - "little things amuse little minds"! I have been having fun with Arduino http://www.arduino.cc/ for my electronics projects for a year or so, so I definitely wanted something that was Arduino-based. I again used the RepRap Wiki and Forums for inspiration, and decided that RAMPS http://reprap.org/wiki/Ramps (RepRap Arduino Mega Pololu Shield) seemed to have all the features I wanted, using Arduino as the processor and programming environment. Still waiting for this item to arrive as I write this (August 20 2011). The extruder tip ("The Hot End") caused me quite a bit of consternation - so many choices, so many variations, what to do???? As a 500W supply, it will provide plenty of amps at 12V to power the RepRap, including a heated print-bed if / when I decide to install one. And because I have taken off -12V, -5V, Ground, 3.3V, 5V and 12V tappings to the binding posts, I will also be able to use it as a general purpose desk-top lab power supply for my other electronics projects. would I go for a full all-in-one kit, or source the parts from a range of suppliers. 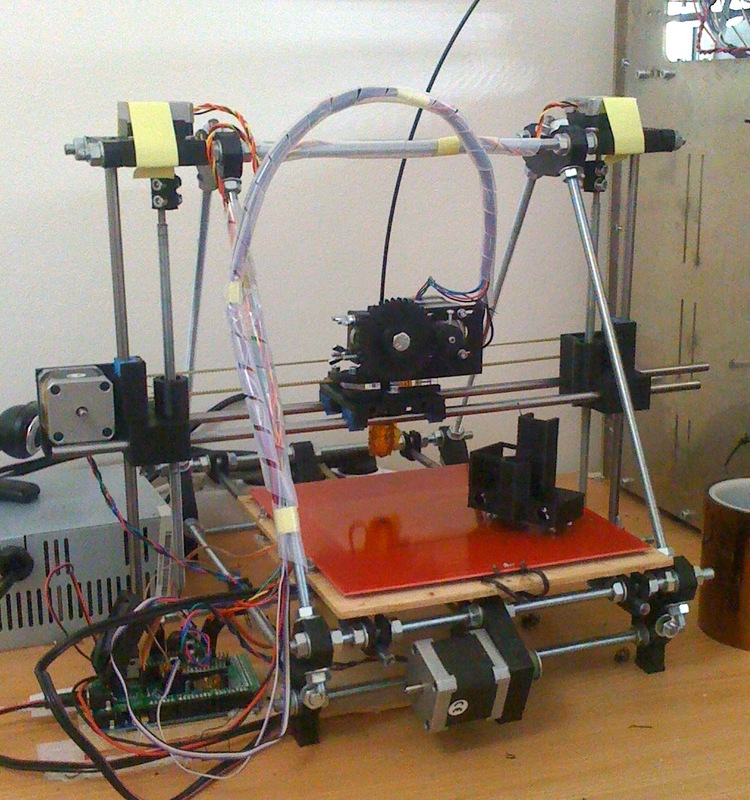 Where to buy - eBay, links in RepRap Forum posts, track down RepRappers in my neighbourhood, or what? 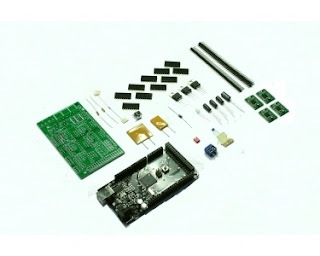 The whole ethos of RepRap seems to be about encouraging "do-it-yourself", so I decided to go for a range of suppliers, but I needed the RP parts, and I don't know any local RP owners, and I figured I needed to make sure that the main "hardware" components were "spot on", so my first big decision was to go for a kit of RP parts and basic hardware (the "Vitamins"), and then source everything else as best I could. I hunted around a bit, and eventually decided to buy a Metric Prusa kit from an eBayer in the USA by the name of "elderfarrer2hy7" (if you are interested, you should be able to find him on eBay; I haven't linked to the original listing because it will probably "evaporate" eventually) - kit price was US$164.95 (+ US$58.50 P&P to Australia), for a kit containing "all the Printed Parts for your Prusa, Plus all the Nuts, Washers, Bolts, Belts, Springs, Bearings, Bushings and 5mm Clear Acrylic Sheets (Still has protective blue film on). Plus all the Printer Parts for a Wades Extruder and the Bearings, Washers, Nuts, Springs and Bolt (Not yet Hobbed)." The price was good, even if the P&P cost to Australia was a bit dear - but by this time, I was too keen to skimp on the P&P cost and maybe wait weeks to get the bits in my hot little hands! Only problem for me at home was - the cost! I just couldn't justify spending several grand on what was ultimately just a super-geeky toy! But nevertheless, I have been following developments with keen interest over the years, watching and waiting for the price to come down to something more manageable. It started to look like I might be able to build something for an outlay of AU$500 or so. Hmmmm .... very interesting! Anyway, I have decided to bite the bullet, and have a go at building my own Mendel Prusa. I intend to follow the progress here - let's see how I go! I am posting progressive pictures on my DropBox page www.dropbox.com/gallery/19079824/1/Mendel%20Prusa%20Build?h=b8dfe9 , but you will find a more comprehensive discussion on this blog.